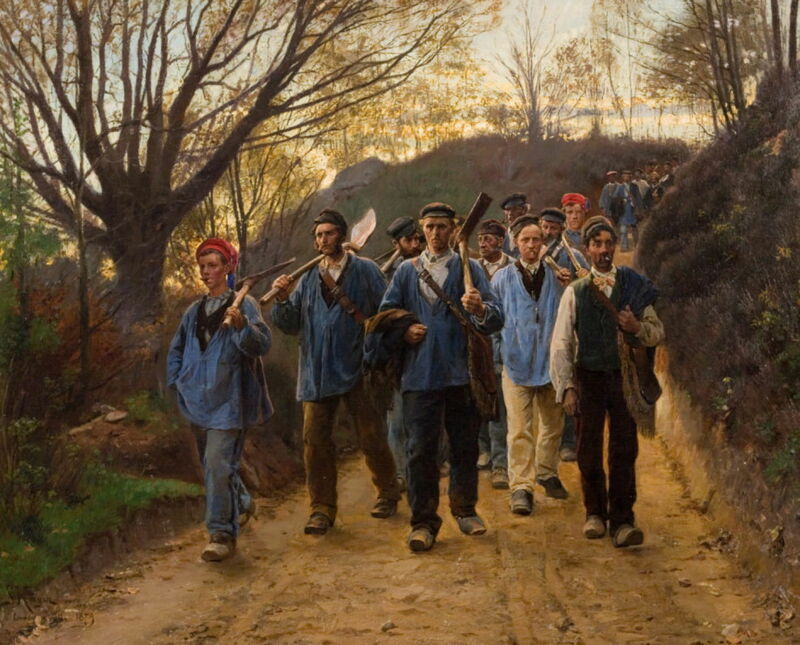 Peder Severin Krøyer (1851–1909), French Forestry Workers on a Track (1879), oil on canvas, 80 × 100 cm, Ribe Kunstmuseum, Ribe, Denmark. Wikimedia Commons. Artists, for all their individuality, are usually a sociable bunch, and have always tended to group together. It wasn’t really until the popularisation of outdoor landscape painting in the nineteenth century that they formed ‘colonies’, though. 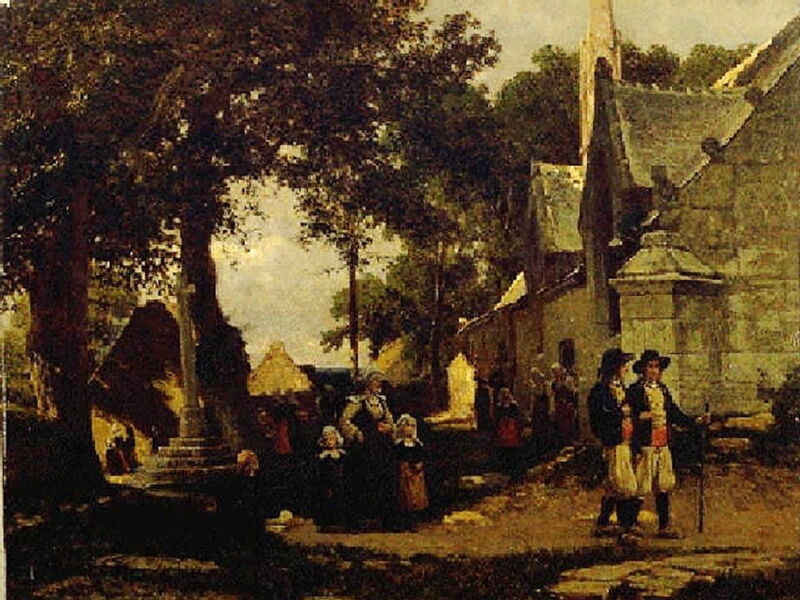 Tiny villages like Barbizon, on the edge of the Fontainebleau Forest in France had barely attracted attention until 1829, when Corot started to visit it each summer. 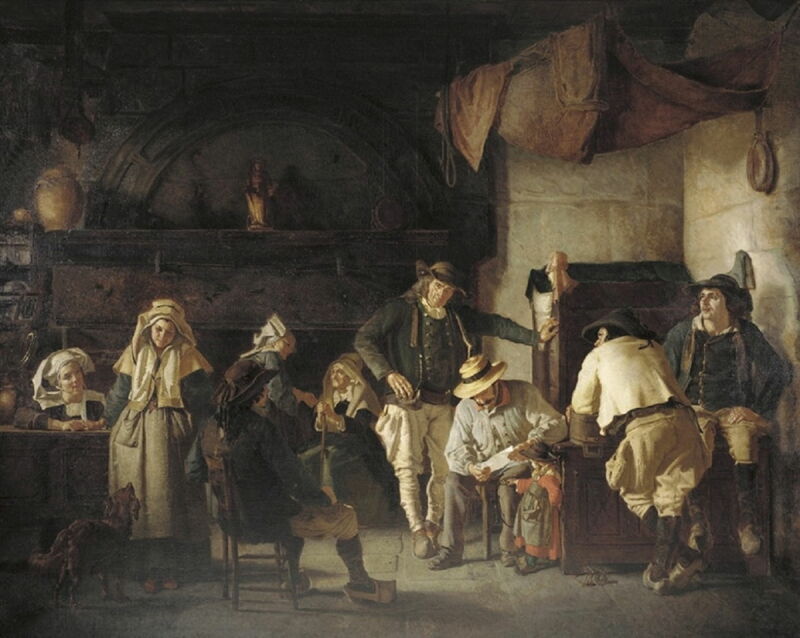 By the middle of the century, it was commonplace to see artists at work around the village and its surrounding country, and they were quickly known as the Barbizon School – turning a loose geographic association into an art movement of considerable importance. As the Barbizon School was (all too literally) dying in the late 1860s, another colony was forming, in the village of Pont-Aven in Brittany. This became one of the most popular and influential colonies, visited by hundreds or even thousands of artists, well into the twentieth century. Its most famous member was Paul Gauguin, who was at its centre in the late 1880s, when it was second in importance only to Paris itself as the hub of development in painting. This series of three articles outlines its history as an art colony, by showing some of the paintings made there, and considers whether it was coherent enough to be considered a ‘school’ or movement. In 1860, Pont-Aven was a small village straddling the River Aven, some miles inland from the coast of Brittany. A few artists seem to have made their way there to escape the crowding and cost of living in Paris during the previous decade, but it wasn’t until the railway connected Paris with Quimper in 1862 that reaching Pont-Aven became straightforward. Otto Weber (1832–1888), Return to the Church (1864), further details not known. Wikimedia Commons. The German landscape painter Otto Weber (1832–1888) arrived in the village in 1863, and the following year painted Return to the Church (1864) somewhere nearby. He exhibited the first of his paintings from Pont-Aven at the Salon in Paris in 1864, left France with the start of the Franco-Prussian War in 1870, and was invited by Queen Victoria to work in Britain from 1872, where he died in 1888. The year that Pont-Aven first featured in the Salon saw an influx of American painters to the village. Among them was Robert Wylie (1839-1877), who remained painting there until his death. Robert Wylie (1839-1877), The Postman (1869), oil, dimensions not known, Pennsylvania Academy of Fine Art, Philadelphia, PA. Wikimedia Commons. Wylie seems to have been more attracted by the local characters, domestic genre scenes, and probably the low cost of models, than by the local landscape. The Postman (1869) is fairly representative of his surviving work from this time. Robert Wylie (1839-1877), The Models of Pont-Aven (c 1870), oil on canvas, 54.6 x 74.3 cm, Terra Foundation for American Art, Chicago, IL. Wikimedia Commons. 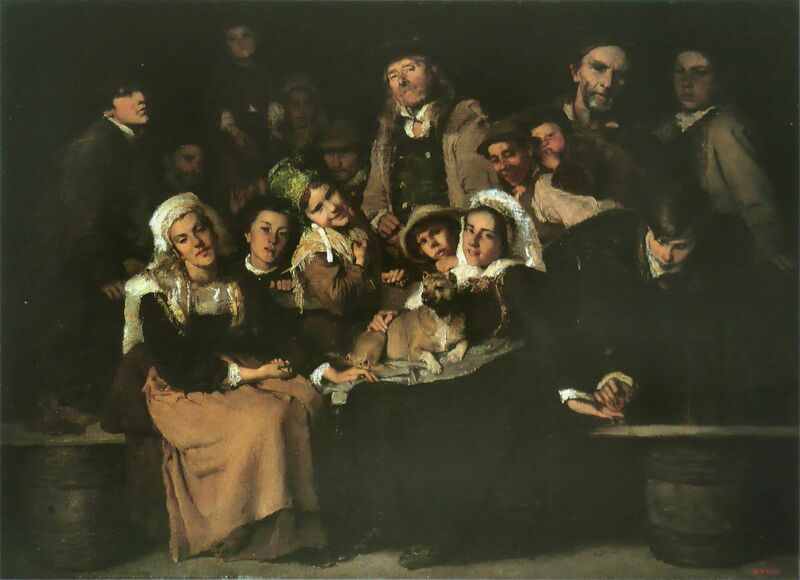 Wylie’s The Models of Pont-Aven (c 1870) is a group portrait in the spirit of Rembrandt, showing some of the characters who modelled for him there. More American artists arrived in 1866: Frederick Bridgman (1847–1928), Benjamin Champney (1817–1907), Earl Shinn (1838–1886), and Howard Roberts, (1843–1900). Then a couple of years later, the Dutch painter Herman van den Anker (1832–1883) came to the colony too. In view of its later history, that year (1868) brought one of the most surprising painters of all: William Bouguereau (1825–1893). William-Adolphe Bouguereau (1825-1905), Washerwomen of Fouesnant (1869), oil, dimensions and location not known. Wikimedia Commons. Bouguereau originated from La Rochelle, further to the south along the coast of the Bay of Biscay, and had already enjoyed a meteoric rise to fame. He had won the Prix de Rome in 1850, studied and painted in Rome from 1851-54, had been awarded the Legion d’Honneur in 1859, and had sold a painting to none other than Napoleon III, which had been hung in the Empress Eugénie’s apartments in the Tuileries. 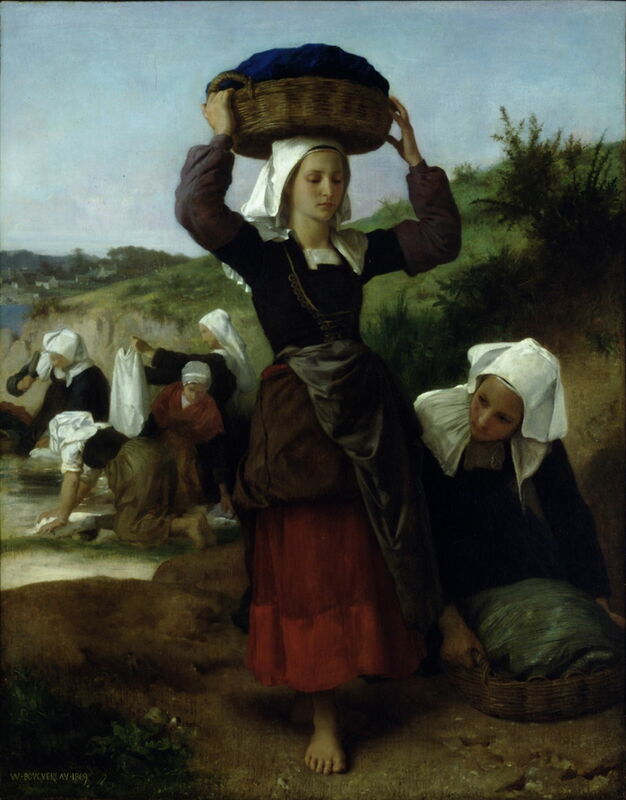 He most probably came to Pont-Aven on completion of four years decorative work at the Grand Théâtre in Bordeaux, to refresh his work with paintings such as the Washerwomen of Fouesnant (1869). Clement Nye Swift (1846-1918), Harvesters of Seaweed (date not known), further details not known. Wikimedia Commons. Pont-Aven remained popular, particularly with American artists. This was in part due to the recommendations of teachers such as Jean-Léon Gérôme that their pupils should paint there. In 1870, Clement Nye Swift (1846-1918) fled to the village from Paris, at the outbreak of the Franco-Prussian War. He stayed for ten years, during which he painted Harvesters of Seaweed and the majority of his total work, exhibiting at the Paris Salon until 1880. An even more important American artist who came to Pont-Aven at this time was J Alden Weir (1852–1919), who stayed more briefly in 1874 when he was a student at the École des Beaux-Arts in Paris. 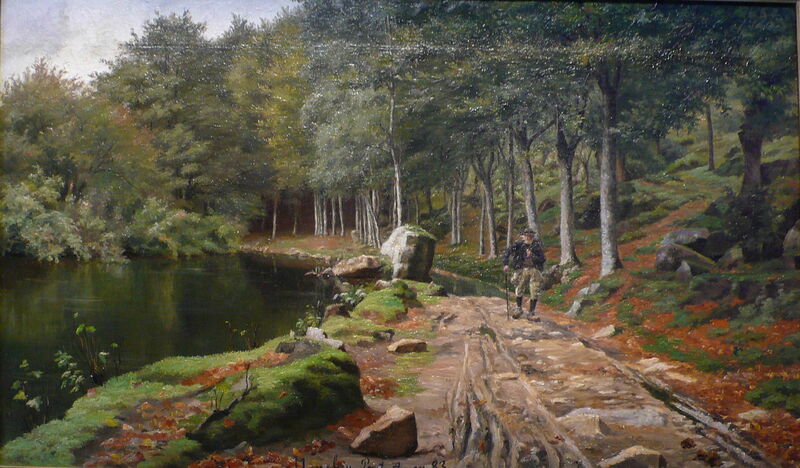 Sadly I have been unable to locate suitable images of any of his paintings from Brittany. By this time, the colony was thriving, and truly international in composition. The British painter Adrian Stokes (1854-1935) paid his first visit in 1876, and was to return to Pont-Aven in 1883; again, I lack any suitable images of his work from this time. William Lamb Picknell (1853-1897), The Port of Pont-Aven (c 1879), media and dimensions not known, Phoenix Art Museum, Phoenix, AZ. Wikimedia Commons. William Lamb Picknell (1853-1897), another landscape artist from the US East Coast, arrived in 1876, and seems to have stayed in France for some years. 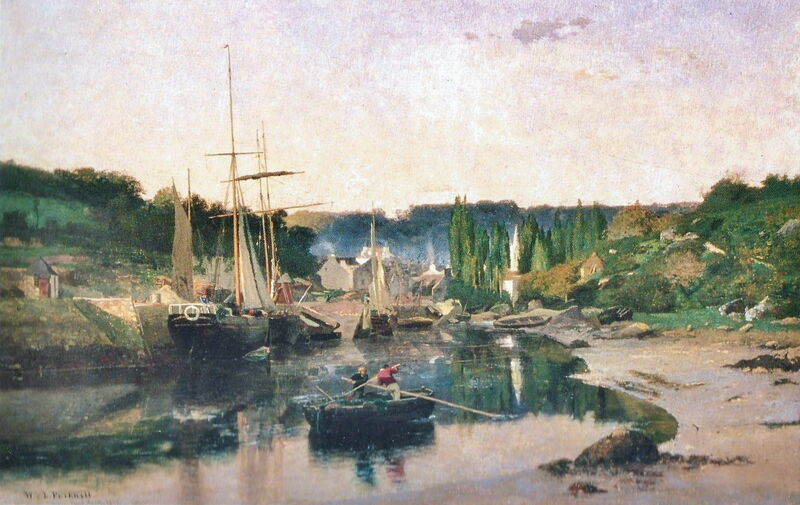 His painting of The Port of Pont-Aven was made around 1879. The American Frank Crawford Penfold (1849–1921) lived in Pont-Aven for one of the longest periods. Soon after his arrival in France to study painting in 1877, he moved to Pont-Aven, where he remained until his death, over forty years later. Peder Severin Krøyer (1851–1909) spent the period 1877-81 travelling in Europe, which enabled him to study under Léon Bonnat, and to visit Pont-Aven, probably in around 1879, when he painted French Forestry Workers on a Track. He went on to become a key member of the Skagen painters, also known as the Danish Impressionists. Marie Luplau (1848-1925), Le Bois d’Amour (The Wood of Love) (1883), media and dimensions not known, Musée Pont-Aven, Pont-Aven, France. Image by DeuxPlusQuatre, via Wikimedia Commons. Another Danish artist who appears to have visited Pont-Aven in the early 1880s is Marie Luplau (1848-1925), whose Le Bois d’Amour (The Wood of Love) (1883) is now in the museum there. She then ran an art school for women in Copenhagen, with her partner Emilie Mundt. 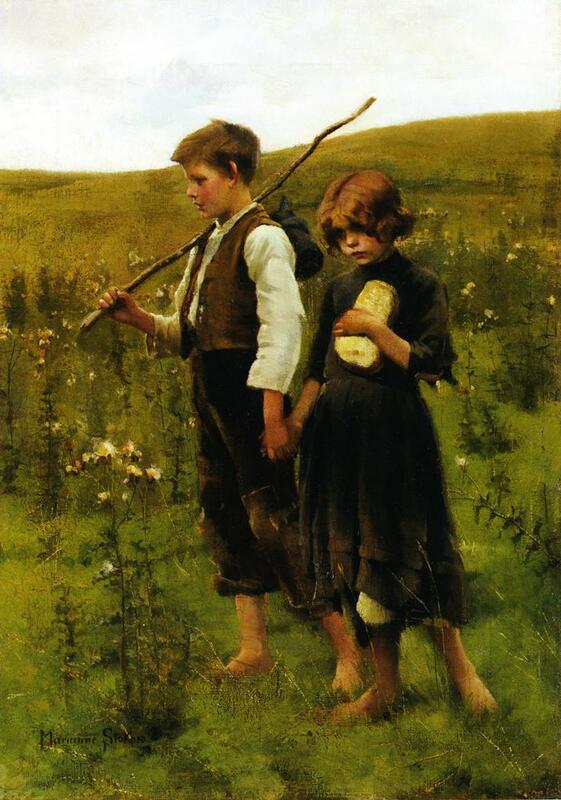 Marianne Stokes (1855–1927), Homeless (On the Way to the Fields) (1885), oil on board, 55 × 38 cm, Private collection. Wikimedia Commons. The final artist who I will mention here is the Austrian Marianne Preindlsberger, now better known as Marianne Stokes (1855–1927). She was at Pont-Aven with her Finnish friend, the painter Helene Schjerfbeck, in 1883 when Adrian Stokes visited, and the couple married later. In 1886, two important artists visited Pont-Aven for the first time: Paul Gauguin and Émile Bernard. They will be the subjects of the next article. Posted in General, Life, Painting and tagged Bouguereau, Krøyer, landscape, Luplau, painting, Picknell, Pont-Aven, Stokes, Swift, Weber, Wylie. Bookmark the permalink. A Robert Wylie Breton portrait will be coming up for sale at litchfieldcountyauctions.com in the near future.